Tom Cruise: "I Have in No Way Cut Suri Out of My Life"
Suri Cruise and Tom Cruise visit Charles River Basin on October 10, 2009 in Cambridge, Massachusetts. The actor's two-page description of his relationship with his daughter was filed Tuesday in a case against Bauer Publishing Co. The actor is suing Bauer over a pair of 2012 tabloid stories that claimed he had "abandoned" his daughter. 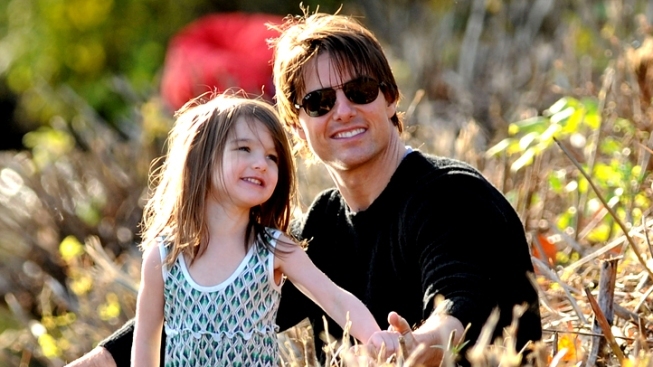 The stories in Life & Style and In Touch magazines cited Cruise's absence from Suri's life due to overseas film shoots. "I have in no way cut Suri out of my life — whether physically, emotionally, financially or otherwise," Cruise wrote. He said despite filming back-to-back movies in the second half of 2012, he spoke to his daughter nearly every day and got frequent updates about her from her mother, actress Katie Holmes. Bauer's lawyers argue that a judge should reject Cruise's motion. Their lawyers also cited files they have turned over to Cruise's legal team that describe the magazine's reporting and statements from confidential sources that the actor had missed Suri's first day of school and could have flown to New York to see her. Cruise sued Bauer Publishing in October 2012, and his lawyer Bert Fields attacked the notion that the actor had deserted his daughter as a "vicious lie."